– aka Double Brewday Craziness! One thing you have to beat as a new home-brewer is ‘The Drinking Curve’. Effectively this means that you have to produce more beer than you are consuming between batches to allow yourself to build up a stock in your beer cellar! For some this may be an impossibility, for me… it ‘should’ be just a matter of brewing two batches on one weekend. Of course, as someone who doesn’t take the easy route, I decided to brew both on the same day. And furthermore, to brew them at the same time! As one beer moved from mashtun to boiler, the tun would be cleaned and the next mash would start! 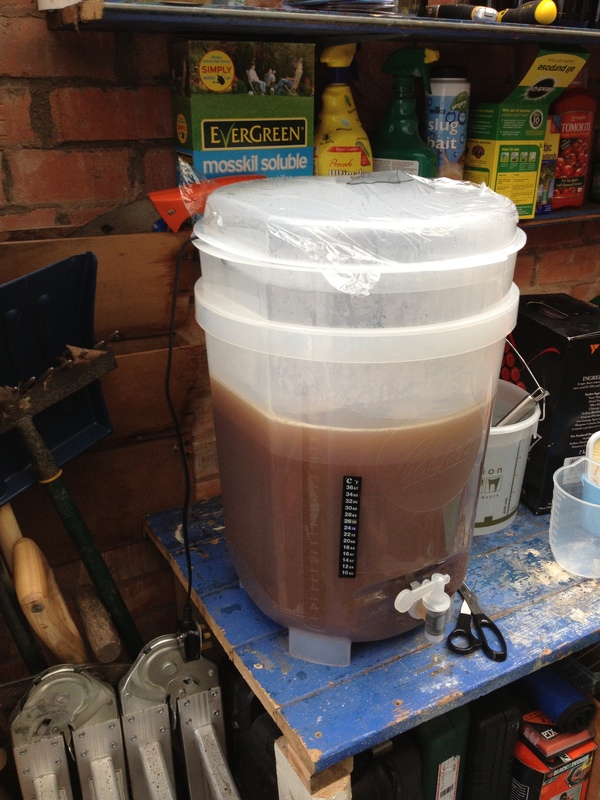 The theory was that this would only take a couple of hours more than a normal brew day… like I said… that was the theory! Alarm clocks set for 6am and the DVB: Gold was up first! 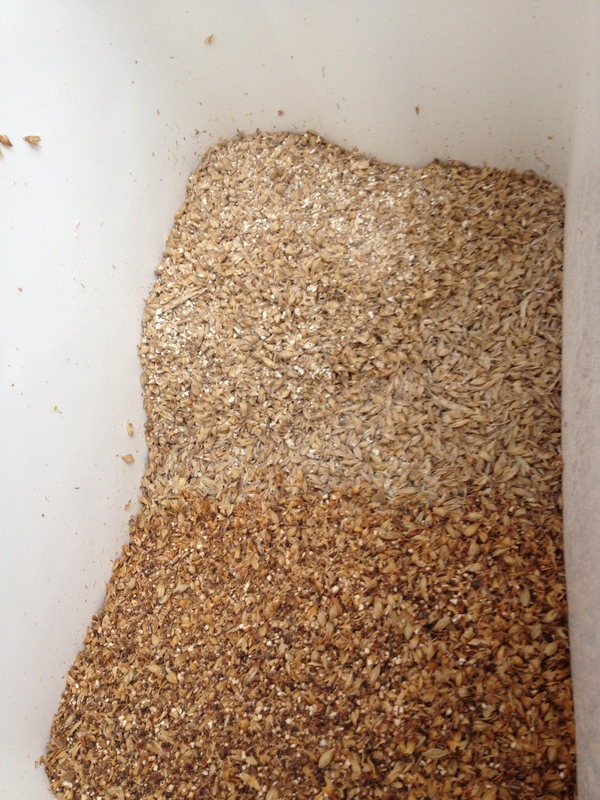 Here are the grains before the water was added. You can just about make out the three different varieties in this shot. Once the mash was on, I retired to the tv and watched the Grand Prix while loading up on Coffee! The sweet DVB: Gold wort drained into the boiler with the hop additions. Unfortunately the power consumption having both boilers running off the same 4 socket extension proved too much and after two F1 inspired blown fuse changes later it was all systems go again! 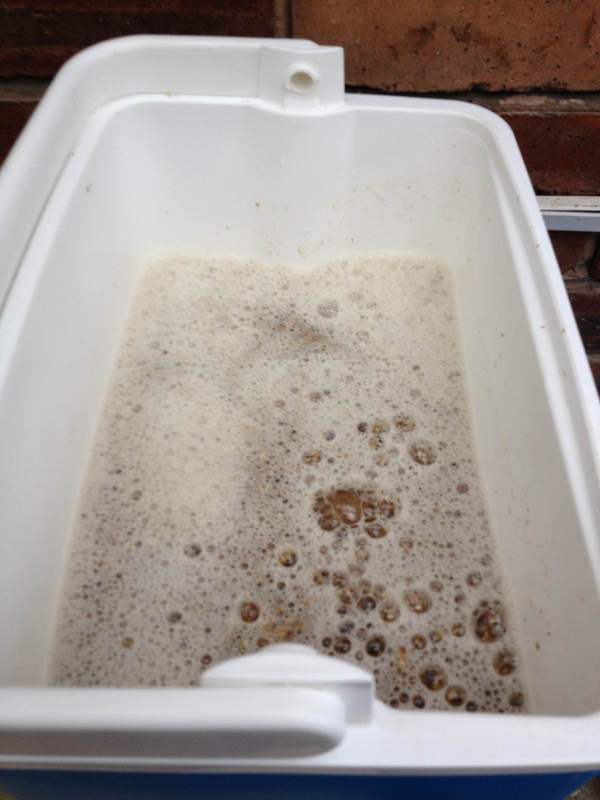 While all was going wrong in the DVB: Gold camp, I still managed to get the Steam Beer into the mash tun. No time to relax during this mash though as the extension lead I used for the wort boiler decided to cut out and needed swapping out for a more ‘robust’ one! Unfortunately this had an adverse effect on the boil and as I was not able to hold a full rolling boil for 90 minutes the O.G. came out at a cringe-worthy 1.034. At this rate the finished beer would be hard pushed to break 3% ABV! Needless to say I carried on and with the boil completed the DVB: Gold was transferred into the fermenter, the yeast was added, and I crossed my fingers and hoped for the best. Best case scenario now, it’ll be a 3.3% tasty session ale which you’ll be able to drink lots of without too much falling over! There was no time to dwell on what might have been though, the boiler needed cleaning and preparing for the Steam Beer. Here it is mid-transfer! 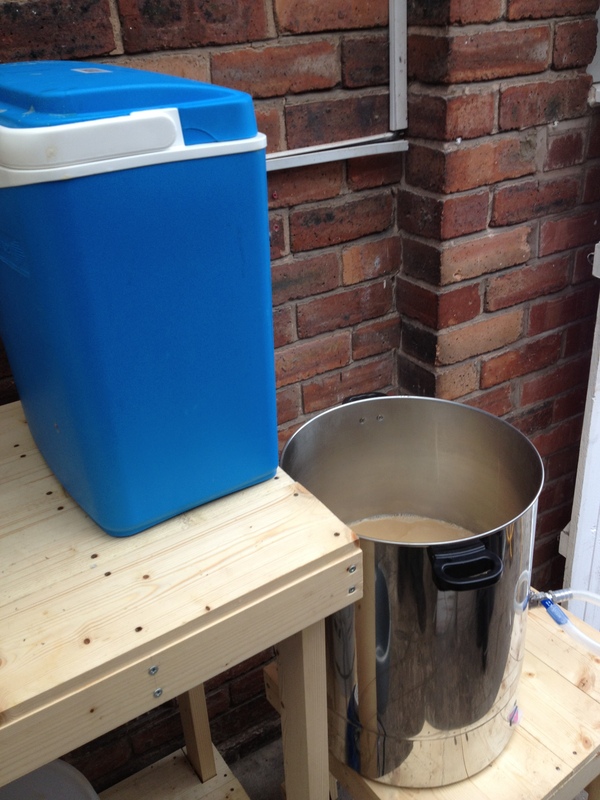 Fortunately the Steam Beer’s boil was much less eventful, and the resulting OG of 1.050 was much closer to target. This should work down to around 4.8% ABV after the yeast does its work. 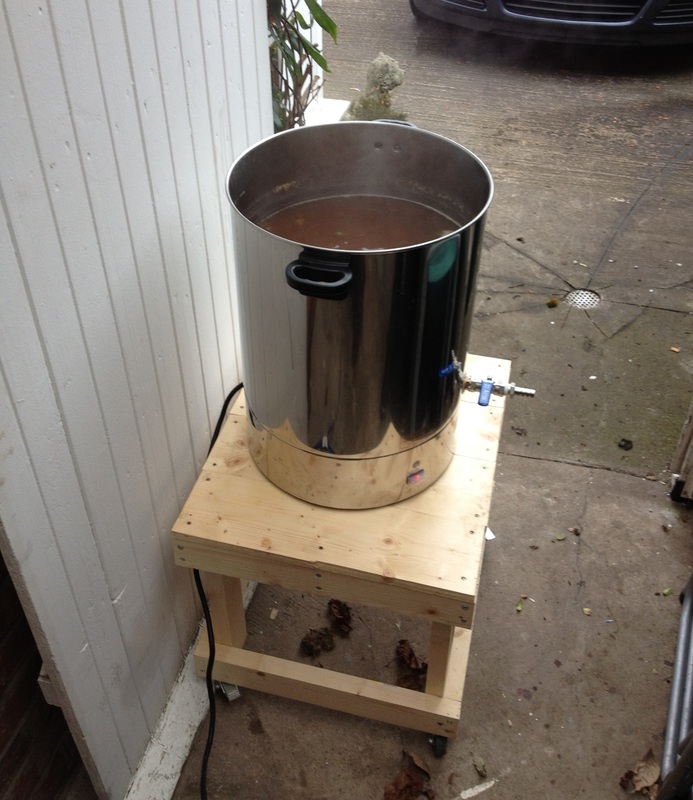 Now was the time for the new process on the Steam Beer – dry hopping. Dry hopping is where hops are added to the fermenter (or secondary fermenter) for a number of days to impart even more hop aroma into the beer. These additions are done AFTER the fermentation is pretty much complete (after 10days or so), but in my haste (to get out of the brewery) I didn’t read enough about dry hopping to learn this and added the hops straight into the fermenter along with the yeast, oops. It was too late to do anything about this now and I was extremely relieved when fermentation finally started after 3 nervous days of seeing no yeast activity! So there we have it, the double Brewday completed. In the end it turned into an 7 hour brewing marathon but, fingers crossed, I should have finally broken the drinking curve! Would I do it again? Perhaps, but even with all my concentration going on brewing two beers there were still a few silly mistakes and a lot of stress when the technical gremlins started to get involved! I also failed to consider that a double brewing day would also mean a double bottling day, finding double the space for conditioning the bottled ales, a double labeling session, and of course a double blog post… at least there is a double tasting session on the horizon though!